A smoothie is a thick shake blended with fresh fruits with milk or yogurt. We always make banana and mango shake at home, but I want to try this mango-banana combination for smoothie. 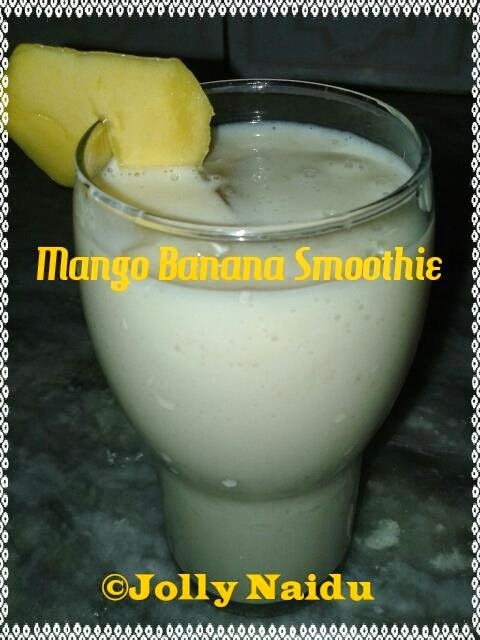 I like this combination very much..So, today I tried this mango banana smoothie at home and posted now. This is very healthy smoothie and a great evening and morning breakfast. 1. For preparing mango banana smoothie, Add mango, banana and sugar in to blender. Blend until smooth texture. 2. Add chilled milk, honey, ice cubes and blend into a fine smoothie. 3. Serve chilled and garnish with mango/banana slice.